COLUMBIA, Md. - April 8, 2018 - PRLog -- "Robotics: The Only High School Sport Where Every Kid Can Go Pro." The FIRST Robotics Competition (FRC) is by far the largest international high-school robotics competition and is described as "the ultimate Sport for the Mind." Each year, FRC announces a complex challenge and then teams from around the world have 6 weeks to build a 120lb robot to meet the challenge. The robots compete at local and regional events and those that qualify can attend the World competition in Detroit where 30,000 students from the top teams meet for their robots to do battle. 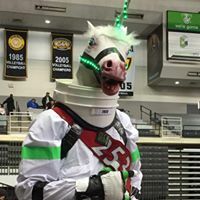 In Columbia, Maryland, Atholton High School's FRC Team #2537, known as the Space RAIDers, is the largest robotics team in Howard County with 84 students and 40 mentors/volunteers. Now in their 11th year, Atholton (and its aptly named robot, the Space Invader) has qualified to compete at the World Championships for the second year in a row. "Our team is student-led with mentors providing training and serving as subject matter experts. In addition to software, electrical, and mechanical engineering, this program teaches the teamwork and leadership skills that are critical for our next generation of scientists, engineers, and entrepreneurs," said David Albert, Lead Mentor. STEM outreach is a core principle of FIRST robotics and Atholton's team is deeply committed to raising community awareness and involvement. Students run workshops and demonstrations focused on helping younger students of diverse backgrounds engage in STEM through hands-on robotics demonstrations and training. In the fall of 2017, the team also sponsored an open house as part of the Maryland STEM Festival. Among this year's sponsors is Brendan Iribe, Oculus Founder and Atholton Alum. The team's participation in the World Championships is graciously being sponsored in part by Leidos. Team #2537 is actively seeking additional sponsors to make tax deductible donations via the Atholton Technology Boosters. Team #2537 Annual Sponsors include: Platinum: Iron Mountain; Gold: Brendan Iribe, DoD STEM, Energy Systems Group, Leidos, Freedom Consulting Group; Silver: Gibbs & Cox, Grace, Howard County Tech Council, Maryland Space Business Roundtable, PTR Group, TransTechSol, SparkPost; Partners: Conning, Hackground, Howard County Public School System, Praxis Engineering, Synergist Computing, Tenetics LLC, TiresiasTechnologies. The team's progress in Detroit can be viewed via live streaming. Visit the SpaceRAIDers website to donate via PayPal. Follow the SpaceRAIDers on Facebook (https://www.facebook.com/team2537/).